Hi everyone! Meet Charlie and Kenzie, our new cats! They’re barn cats, meaning they live outdoors and will hopefully help us with varmint problem! 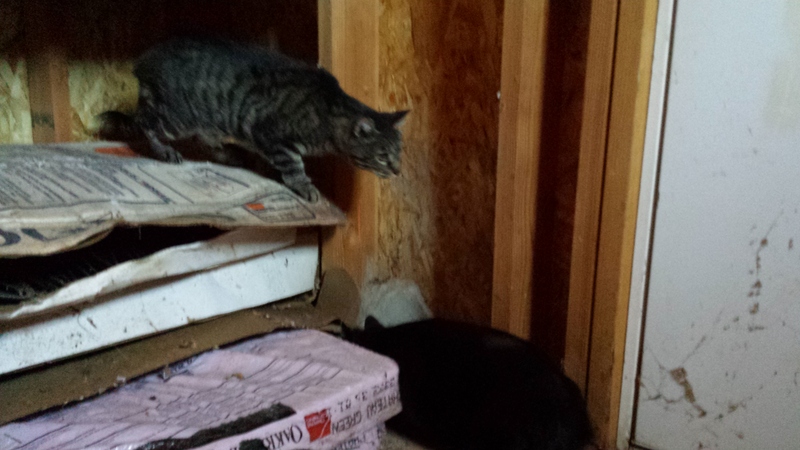 Charlie is the tabby on the top of the picture (he’s 8), and Kenzie is the little black one trying to hide at the bottom (she’s 5). They were surrendered to the animal shelter together, so I thought I’d keep them together. They were both outdoor cats before, so perhaps they’ll keep each other company! We’ve tried a lot of different things to rid ourselves of the moles, gophers, and mice, but now we’re trying the truly natural method! They’re getting settled into their new home down in the pump shed where they’ll stay for about a week before we let them out to explore our property. Hooray for new pets!